Thread: C.O.W. - #059: Creek Crawler - Voting! Upon reaching Dagobah, Yoda realized that certain habits he learned to cherish had to change. Such was the way of the Force. His rations ran out, and there was little edible vegetation native to Dagobah. Yoda understood that in order to survive the many years of exile, waiting for the son of Anakin to grow up and join him on Dagobah, Yoda would have to forgo his strict vegetarian diet and become an omnivore. He did not mourn those creatures he captured and ate, for those that pass on from this life become one with the Force. But, he did have certain rules of engagement with respect to hunting and capturing food. Yoda only allowed himself to capture and eat small predators that were, themselves, caught in the act of catching prey. Yoda felt this honored the circle of life that was the Force and in the process saved a life more vulnerable than the one he had to take in order to eat. Yoda was particularily fond of Dagobah's Sawn Mantid, an amphibious crustacean that was very swift and very beautiful to watch in action. The Swan Mantid could make itself so still and move so quickly in its strike for swamp minnows, capturing one tested even the reflexes of a master Jedi. However, Yoda was never embarrassed to admit to himself that more than a few Swan Mantids had escaped his grasp...for that too was the way of the Force. These majestic beasts roam the little creeks that surround the amazone river deep inside the rainforests of Brazil. They are extremely shy and have rarely been encounterd by humans. The native indians of the area regard them as direct descendants from god, and worship them by bringing them offers. Theyre name stems from the portuguese translation for blue shadow. Because of their shy nature people only see a blue shadow moving through the woods. They are also called blue spirit or blue ghost by the natives. The Sombrazul feeds mainly on fish and prefers to live close to small creeks. They use their long limbs to wade through the undeep waters and hunt for fish. The Sombrazuls have no natural enemies. Their skin is covered with a highly poisonous slimy coating that protects them from harm. Their brightly colored skin is a warning for predators and these colors are also used in the mating rituals. The skin that hangs between their long legs is their main tool in attracting a mate. The Sombrazul with the most flamboyant skin decoration will be most succesfull in reproduction. A fat lazy creature living near creeks. It spend most of it's time sleeping. While awake they go out looking for food or they take a walk. They mainly eat plants growing only at creeks. Sometimes they accidentally happened to catch a fish during their walk, that's the most awesome food they can think off. When defending against predators. They use their shell to guard, waiting for an great opportunity. They'll quickly roll over their predator once they have the chance. Because of his large body, the predator will get crushed. Swampy is a regular creek crawler, which lives in almost every dark & wet place of fantasy forests. Most of his free time he's hunting for pink rabbits. Rumors say that Swampy is the one of descendants of the Ancient Ones, but we're unable to confirm that. One thing is sure - if Swampy is in forest, none of pink rabbits can feel safe and comfy! The Glah Klund Gullywyrm inhabits the shallow creekbeds around Muskingum and Guernsey counties in the Eastern region of Oh Heighyo. Non threatening to humans, the GK Gullywyrm is the fastest known species of annilideavermi known and can commonly be seen crawling through the many creeks in search of food. Propelling its movements are silia like nodules on its underbelly moving in rapid succession enabling the creature to cover great distances compared to some of it's smaller cousins. This little creek crawler has the unique ability to blow air through a tiny vessel in its tongue, causing the bulbous tip to float. It will twitch its tongue to attract insects or small fish. When its prey has landed or nibbled on the tip of its tongue a small amount of air is forced back into the mouth of this predator, signaling it to attack. With its large and powerful gills, this animal can create a powerful suction to slurp in its prey within a fraction of a second. They crawl along creek beds with only two whimpy feet, that barely keep their heavy shells and fat little bellies from sinking. The ellusive creek crawler is seen here in it's natural habitat. The creek crawler is known for it's humanlike front appendages. young creek crawlers are often mistaken for men crawling around on their hands and knees, hence it's namesake. The creek crawler's diet consists of small insects and plantlife it finds by overturning rocks in the streams and lakes of coniferous forests. The few times it has been seen in the wild, the creek crawler was seen curiously picking things up with it's prehensile hands, inspecting them in a fashion similar to a young child exploring the world around it. There are 7 known creek crawlers in the world, 2 in captivity, it is estimated by 2015 their population will be increased to over 30 through controlled breeding. It is classified where the captives are at the time being. When the firefly look his prey, he emites a signal for his school. All of them come on the surface and free a part of these gas (blue light, hence the name). It burn in contact with air and high-speed drive the firefly to his prey. The heat created by the gaz burn, spreads over the carapace. The condensate around his head creates an air bubble who cancel the frictions of water. He can attain 300km/h. Once in the corpse of prey, he can freely eat inside. Evolved from a vicious aquatic predator, the Wandering Flower has desived a completely different method of feeding. Rather than having a mouth, the Wandering Flower uses specialized feeding organs to dissolve prey. These mimic the lilypads that are found in slow streams and pools. If an unfortunate frog should happen to land on this pad, it would find itself stuck by a substace secreted by glands covering the surface. The pad wraps up the frog much like a fly in a venus fly-trap and pulls it under the surface with the flexible muscle stalk, where stomach juices dissolve it completely. Since the Wandering Flower has no use for a mouth or deadly fangs anymore, these fangs have become specialized appendages for hauling it across the rocky creek beds, and the legs have shrunk to puny stubs that act mainly as kickstands to support the heavy backside. Without any real predators, the Wandering Flower has no significant defenses other than a tough outer shell. When threatened though, it will raise its large claws and expose a bright orange underside in an attempt to frighten away any danger. 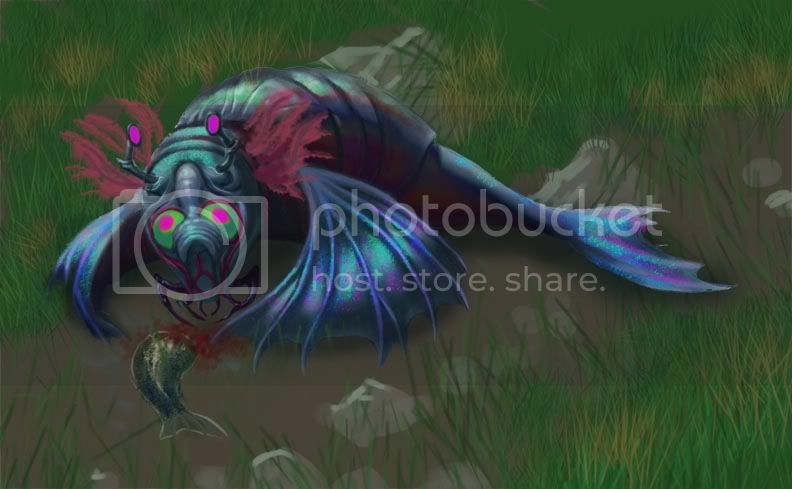 Creature is a creek scavanger and can crawl on fins in low water and swim in deeper water. The world Bromosh is in many ways remarkably similar to the young Earth, but differs importantly in one aspect: its gravity, which is fifteen percent greater than Earth's. Because of this, the dominant vertebrates of Bromosh are not tetrapods but octopods, relying on eight limbs to resist the pull of gravity. Pictured here are three octopods known as Mudplows, one adult and two juveniles. They and their kin are the evolutionary equivalents of amphibians such as Eryops and Diplocaulus of Earth's Carboniferous and Permian epochs. Six of their eight limbs have evolved into sturdy legs to shove its massive skull through the silt. The rearmost limbs are a pair of vestigial flippers. Though serving only as another pair of pushing limbs for the adults, the more agile juveniles use them to aid in swimming. Mudplows feed on worms and the other small inverterates that burrow in the silt on creekbeds. Their broad skulls are extremely sensitive to their movements, and it is thought that the Mudplow has an electromagnetic sense, similar to the hammerhead shark. Due to their large size, adult Mudplows have no natural predators. Creek Crawler (plíživec potočný) – this creature lives in creeks in Scotland and loves fresh fishes. To catch his favorite food he use special hunting techinque. On his back are six sticky tentacles which use as temptations for fishes. When he siting and sunbathing on rocks he wave and vibrate with sticky tentacles and snatching on it insect which flying around (mostly dragon-flyies, flies, butterflies,...) Now he has prepare temptation for his food. He can use two methods how to catch fishes. In first one he siting at rock as normal and use tentacles as fish-hook, wait for good chance and then attack on fish which eating temptation from his „fish-hook“. Second one, more effective, is underwater hunting. 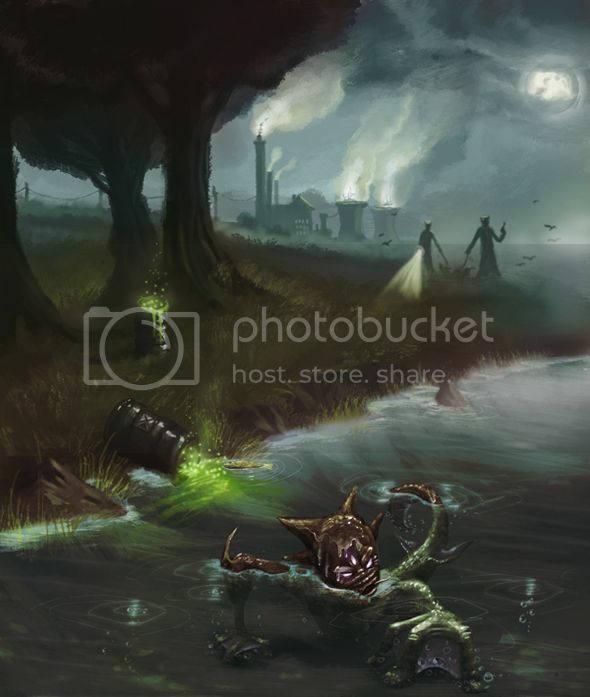 He jump to water, bury mud at creek bottom and only visible things are tentacles preparing to feed fishes (picture two). When he feel grub away fish he fast attack on fish. These creatures where mermaids for only 20 years ago, they lived in the creek and in the lakes where it leads to. they never even saw a human being, until one day a researcher came in there habitat to search for new recources to help them overcome the shortage of powersuply, he found a great source of uranium. In no time big factory's had been build in there once so peacefull surroundings and there creek's and lakes became more and more polluted. As the years went by ,the ammount of nuclear waste was gettin worse And in the population of mermaids Mutanized children where being born, the hatred for mankind begon to grow. The mermaids began taking away children from the industrial villages as payback for there deformed children. but human wouldnt let them, they began a massive hunt for mermaids and soon they where almost extinct and the ones left where creaping and crawling trough there polluted creeks and lakes.. 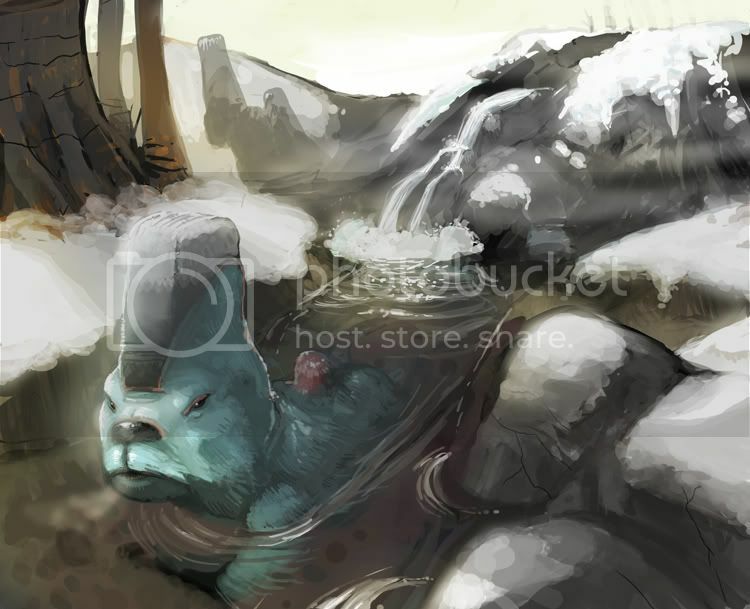 This creature of ghyll is designed for the research of the paleontology. It is a reptile with a not very big body. It lives in the area near the ghyll and preys on beasties and sometimes it also hunts the birdies and eggs. It is alone and cruel. When it comes the time of copulation, the body of the male will become colorful to attract the female. It incubates near the river and spawn together and each time it will lay 8 to 16 eggs. The life span of this creature will be 20 to 30 years. "MOOOOMMMYYYY!!! LOOK AT THAT!!! I FOUND A BEAUTIFUL AMBER STONE!!!" The little girl was so happy, that she found an amber stone in the creek of Boorshtin and on top a fly was enclosed in the stone. There lives a strange species in the creeks - the Amberia. It walks underwater with its eyes above the water surface, looking for flying little insects. When the Amberia spotted its prey it catches the insect with its long tounge, which reminds of an ant eaters tongue. Since the stomach of Amberias are very sensitive, they can't digest the prey like we or most animals do. They have evolved an unique way of treating their meal. While filtering important substances of the insect in the stomach, the Amberia produces with an extra organ where the meal is going afterwards a shell of a special material, which completely covers the insect and makes it easier winnowing it. The Tepiic has a lifespan of 500 years, there is one drawback to his longevity. This mammal develops his physical strenght at a much slower rate than other mammals. His lack of physhical strenght forces the Tepiic to use his weak limbs to crawl his way around. 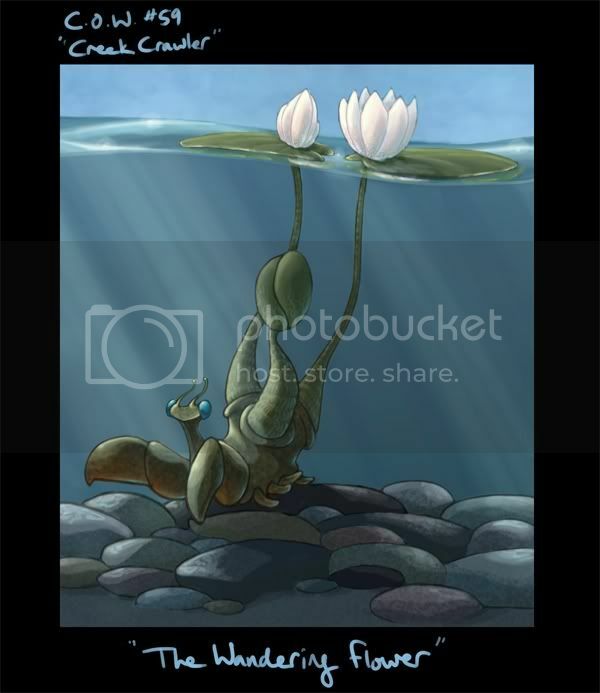 They are frequently found in shallow creeks because they are aided by the smooth rocks within the creeks. This helps them move at a faster speed. By age 300 the Tepiic reaches its adulthood and can become as tall as 50 feet. It's often said that there's such a lot of great work in this round! This time it's my turn to say it. For the moment JakkaS has 100% of the vote. JakkaS' tutorial of his entry for this round!!!! My next two choices are Ostrander and KaWaii. It was tied, but Jakkas is back in the lead. Amber wins with me everytime. Thanks for for another awesome piece. I've already looked at your tut too. Screw greyscale! I'm doing it your way! Jakkas knows best. you got my vote rawwad. i loved how freakin slimy and gross your creature is, i can damn near feel it's gooey skin through my screen. It was a tough decision though. Supervlieg, i really liked yours too, it's very believable, but the size comparison in the lower left doesn't seem accurate. maybe it's the camera angle but it looks at least 3 times the height of a human. that's not why i didn't vote for u tho supervleig, i'm just impartial to slimy things. other favorites of mine is stephan_R's; i'm lovin that lighting, totally amazing. and JakkaS i really like the seashell armor on the outside of your creature, totally cool. good round. I voted for Jakkas, great render and interesting creature. I like the amber turds as well. The shells really make him unique. Superv I thought your environment was stunning, and the creature design was fantastic. The colors on the creature itself turned me off a bit, but great piece. I will give a detailed response about everyone's work when I'm not AT work. Another fun round, thanks for all the feedback on mine. Last edited by Stephan_R; September 7th, 2006 at 06:32 PM. Stephan_R, I voted for yours, but it was very close between you and JakkaS. They are both such beautiful works, but the richness of colours in yours won me over in the end. Awesome work! Not a huge amount of entries this time, so my crits and comments shouldn't take rediculously long. Michael Jaecks- I think this and your nuclear planet devourer have been your strongest pieces. Everything's very clear, and you have some nice color depth and painterly action going on with the creature. My only problem is that the mist behind it is too opaque. I think there needs to be some more suggestion of tree roots and the water receeding back into it. Other than that, good job! Supervlieg- Awesome piece! Great textures, colors, lines, and the whole bit. My only crit, which I didn't notice until Michael Jaecks pointed it out, is that the design on its flap doesn't really fit. It looks good, but I think it should have been more elongated or tapered to fit the shape of the flap of skin. It doesn't hurt the picture very much, though; as I said, I probably wouldn't have even noticed it if it hadn't been pointed out. KaWaii- Nice. I love the texture you used for the creature's shell. Due to perspective, I think the projection on its right side of its shell should be angled upward a little, and the area between the creek's edge and the vegetation isn't very well defined. The vegetation itself looks pretty good, though. Cloister- I like the approach you took with this picture. You captured a very spooky and Loch Ness-y mood. My only crit is that the structure of its arms is kind of hard to read on the main pic. Good job. 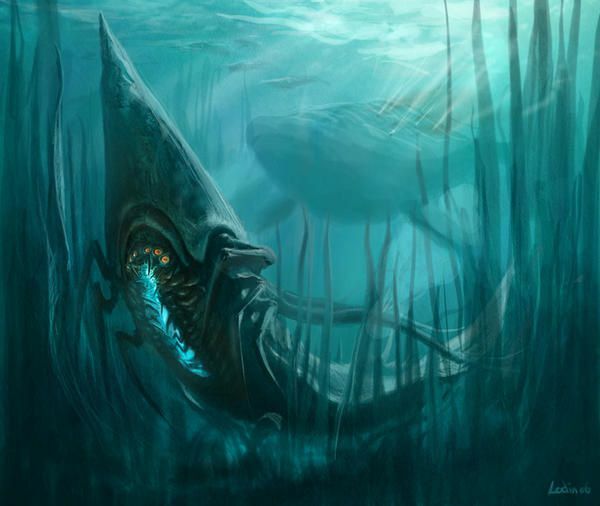 aspenboy- You did a nice job responding to crits and revising the picture in the main thread, so I don't really have much to add here, except the bunny's ears don't look to be both the same length, and that the body of the creature underwater could have been sharpened up a bit. I love the bunny's expression and the little critters back in the forest. The second one from the right looks like Lowly the worm. fughi from yuggoth- You're improving, but you definitely need to practice your basics. Line, shape, anatomy, color, etc. The biggest thing this particular piece needs, I think, is some brighter, richer, more vivid colors. This crit might seem harsh, but it is only meant to encourage you. Ostrander- Nice! I was hoping you'd update this. It's looking good. However, I think you could have taken the colorization further, since most of the colors are still quite pale, and the reflected light on the surface of the water looks fairly whiteish to me. The color quality does capture a certain doom-and-gloom mood, though. Good job. Stephan_R- Nice one, Stephan! Though you'll probably get a lot of "too dark!" comments, I think the hight contrast looks really good. It creates some very definite focal points. The textures and little particles look very nice as well. My only crit has to do with the creature design. I don't really like its tiny wobbly legs. Lodin- Very interesting creature design. It reminds me of something I might have thought up myself. The picture looks good, but is maybe a tad too monochromatic. It's a shame you didn't integrate your black and white diagram with the main picture, as well. It explained a lot. crazyace31- What happened with that background? It and the creature's blobby shadow are my main problems with this pic. The creature itself looks decent. It's right forelimb need to be back farther, though, for its movement to make sense, since its left arm is already extended forward. You try walking on four legs, to get what I'm talking about. ScaryPotato- Nice entry! It has a very clean, simple look that works well. I like the hand-drawn title, as well. You also did a good job of capturing the quality of light in a shallow river like that. Nothing to crit! AztcFireFlower- Cool creature design! There are some problems with it, though. Those feathery things on its head don't seem to have the same level of completion as the rest of it, and its tail needs some more work, especially the end. The cast shadow also makes the tail feel like its hovering. 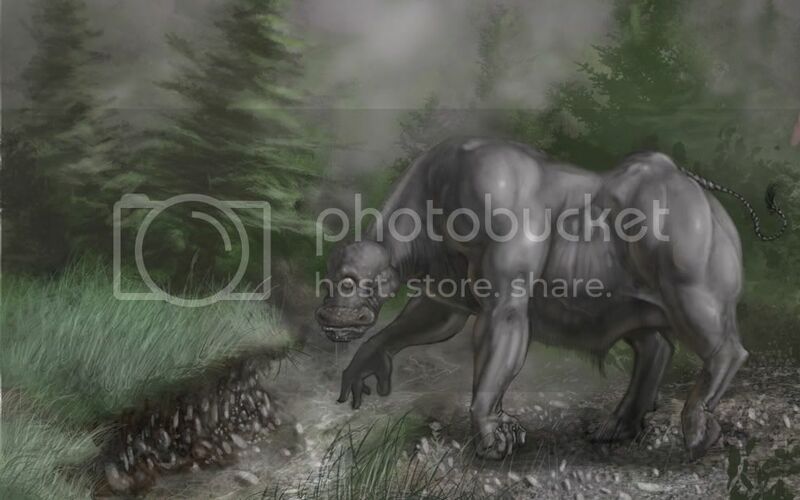 The background is of a lower quality than the creature and its colors don't compliment those of the creature. This sounds harsh, but I really do feel that this is a good picture. It just needs some more work. Moai- This was a fun one! However, looking at it now I see that it could have used more color and temperature changes over the entire scene, and the contrast of the juvenile's cast shadow is so low that probably I'm the only one who'll be able to see it! Despite its flaws, I like it, and it was a good learning experience, like any work of art that I spend any time on. Rawwad- Very nice! Good creature design, and you did very well with the limitations of a mouse, which I know very well. The color job has a minimalist feel that works very well. No crits! I hope you can get some new equipment soon! Joey-b- This is a very strong piece, and I admire the effort you put into improving it. The colors and details are all very nice. I have two crits. First, the beam of the flashlight looks too feathery. Second, the position of the mermutaid's arms are fairly awkward and the forshorting on its left hand is too extreme. Good work! banhatin- Very nice! Excellent job of combining many colors and textures without the picture seeming like an overwhelming mosaic. The clouds in the background also look excellent. However, that water on the lower left is distracting. That's my only crit, though. JakkaS- Well, it looks like you'll take my vote once again. You've created something magical with this picture, JakkaS. I really cannot find a single flaw. It's just beautiful! slondawoda- That's an odd thing to consider beautiful. You did a good job making a very stunted, grotesque creature. Lots of great textures and details. And I think the picture as a whole works without a background. The only thing I'd ask for is a clearer view of the structure of its legs in the side view. BlkCelebration- I love photoshop works with painterly feels! Cool creature design, and nice job setting up the scene. My only crit is that the environment seems to become less clear as it comes closer, strangely. That rock that's closest to us is fairly fuzzy, for instance. Good job, anyway. See you all in the next round! It's my topic, don't ya know! thanks for the advice Moai, i'll definately start playin around with color a little more. maybe the next C.O.W i'll go crazy. Michael Jaeks: Good entry, maybe like my own a bit too 2d. Some slight perspective in the pic would have made the creature a bit more lively. Supervlieg: Nice, but maybe more of a creek walker then crawler. Kawaii: Good entry, though I feel you could have put in a bit more time to knock it up a notch. Try broadening your colors. More intensity, highlights and color varation in the lightened parts. Either lose the bkg altogether or put more work in it. Cloister- You captured the underwater look very well. However the creature itself is hard to read. The connection between the tail and thorax is hard to judge. And I didnt immediatly recognized the thing on the left as its paw. The colors could use more variation too. aspenboy- Nice and funny. Maybe the underwater green parts should be a different color to set them apart from the above water parts. fughi from yuggoth- The colors overall look a bit flat, and the whole thing needs a bit more detailing. Try more brownish greens for the moss next time. Ostrander- Nice one but like kawaii's piece the color range could be broadened a bit to make it more interesting. Overall its a bit too murky. The part of reflected worm in the water should have been its underbelly, the distorted copy doesnt convince as reflection. Stephan_R- Amazing piece, I love the contrast in there. Almost got my vote if mr. JakkaS piece hadnt been so flawless. The only parts that are a bit less is the grass on the left tree (obvious repeating) and the trees in the background. They could use a little more varation in color. Artzealot- Nice one, but could do with a little more intense colors. The anatomy looks a bit weird, probably because its so human like. Somehow that tail doenst seem to fit though. Lodin- Nice piece, like the blue hues. The smoke from the thing in the back is in front of the grass way in front of him. Which kinda breaks up the illusion of depth. crazyace31- Good start, try working on the enviroment and loose the black lines in the creature. And check some anatomy references. The colors look good. ScaryPotato- Nice and soft looking piece. I would have loved to see this one without the outlines. I think that would really make it shine more. Some subtle highlights would also add a lot imo. AztcFireFlower- Nice design, Try painting the highlights instead of using the dodge tool. If you didnt use dodge, try to go easy on the satured colors next time. Moai- Nice one, although I liked the topdown sketch a bit more. The green is a bit monochrome, use a bit more variations next time. Mix in some yellows, some blue bouncing light etc. Rawwad- Nice piece. I love the front. The holes in the back and the tail look a bit out of place though. Great mood with the green and the noise. Joey-b- I like the mood in this picture. Although I would have liked to see the creature take up more space in the pic. The pose, and especially the front right arm looks a bit weird. Looks like he has either no under or upper arm. banhatin- Great piece with excellent colors and creature design. I like the textures you used for the skin. The photolike background is a bit too distracting though. The perspective seems off, and it looks too sharp for the distance it is supposed to be in. slondawoda- Nice, please post a bigger pic next time though. And maybe add a bit more color. Its a bit hard to figure out how this animal would move about. BlkCelebration- Shame there isnt more to see of the animal. The head is quite nicely done. A little inset or something would have been good to show the rest of the body. The background is a bit flat, try less satured and less darker colors the farther you go back. Supervlieg's crawler really got me going, so he's the man in this round for me. I voted for Stephan, with Jakkas coming up just short. Stephan's entry was inventive, had a great tone and was just very well thought out. Jakkas' execution was impeccable, but I think Stephan paid more attention to the environmental aspects of this week's challenge. Nice works everyone. I had to decide between Supervlieg, Jakkas and Stephan_R. Supervlieg's sketch caught my eye from the first minute and the final didn't dissapoint, I love it. It is definitively the most extraordinary beast in the contest. I voted Stephan_R. The mood is perfect. It reminds me of a painting that used to hang in our town library. A huge old tree with it's roots underwater and kids playing on the tree. I just love this piece for it's sheer mood. Ostrander you have my vote. Good concept, nice render, could see it in a story book. Rawad for the really unique style. really attrctive peice. Great work all. Well done fozzy for getting this one together nice and quick. Thanks, Supervlieg. I actually did go in and put some yellow greens and blue greens on color painting mode, but I thought it was too extreme and toned it down somewhat. Too much, apparently. I'll vary the crap out of the colors in my next entry. Runner ups were Lodin and Supervleig. Week after week - keep the participation blazing guys. Just great ideas from all participants. Supervlieg's Sombrazul: Indeed he looks like he wouldn't have natural enemies. I think that long limbs convey a life stepping around tangled objects, flora underfoot. I cannot crit the beast because I think it's color and design are elegant. I like the environment and soft lighting. The one thing that distracts me is the placement of the black foliage shape under the beast, aahh, it's just me, no big deal. Everything is so strong in this piece, as always. Thank you for the crit. I just need to work on....everything....basically. But, will keep in mind the advice to paint more and use less PS modes. All have smart designs. But can only vote for one so my vote for: Stephan_R's Angler Mud Mouse: The lighting here is just terrific. Wonderful play with sillouhettes. What I like is the minimal detail and great use of shapes against value. Just where it is needed to draw the attention. Excellent composition and concept. Will learn much from this piece. Michael Jaecks I like the idea. Only thing I would crit is the too even lighting on the creature from front to end, top to bottom. I think a drop off of light and value would add even more interest. Strong creature design. No crits there. Lodin Horrific creature to punch holes in prey. To me seems not a beast of a creek though, but of an ocean, judging from the whale shape in the background. 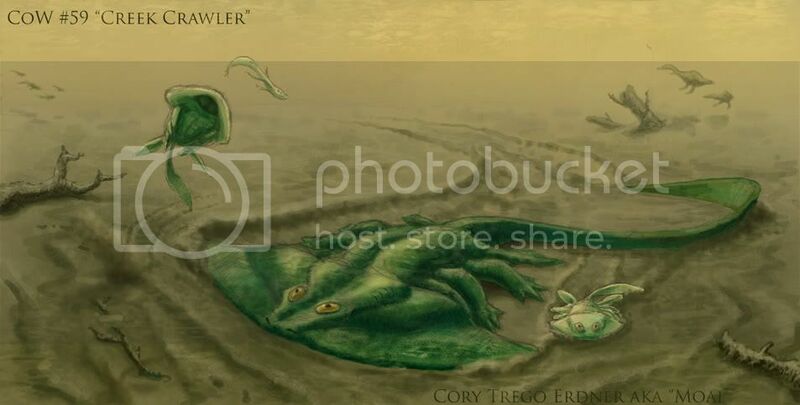 I think of a large and formidable swimmer, not crawler. The design is really good and unique, in any case. Nice depiction of underwater environment, too. ScaryPotato As mentioned B4, like the simple and elegant finish to this piece. Nice palette. Thanks for the comments. Moai Your idea sketches are always interesting to look at. I look forward to them in COW threads. I like the final design of the critter and the concept. Minor crit; I think as already mentioned, color scheme is too limited. I wait to see your next entry. Thanks for the comments. Not harsh at all. I appreciate time taken to crit it. i'm here to learn. Rawwad Like the design and simple shape of the creature. It stands alone without the tentacles. The tendrils, to me feel more like,......eehhm,.....parasites that have bored holes into the poor beast. Otherwise your skills in drawing and rendering translate across any media beautifully. Banhatin I expected a nice painting and wasn't disappointed. Your drawing is so practiced and elegant. The soft colors in the creature are so beautifully realized. grabbing my attention and i just wish I knew a little more about it. I look forward to your next entry. Cloister The lighting gives it a documentary, Nat. Geo. and a menacing feel which I really like. A quick snap before the photographer gets pounced on and tore up. Last edited by AztcFireFlower; September 8th, 2006 at 05:38 AM. Jakkas: I like the shells, it gives him some history with his surrounding. I especially like the amber poo, what a great idea. To me, he did feel a little cliche' like other creatures and monsters I've seen (tentacles and spider-like) BUT you get my vote because of all the details that bring him to life and a wonderful description. slonawoda: Some nice details in there. The different colored tusks are a bit distracting, and a short description didn't help but no biggie. BlkCelebration: I really like this! I think with some more time you could have polished it a bit more. I'm not a big fan of the white highlights all over the face, or the monotone fur, maybe try mixing in color for some variation on those issues next time great idea, thanks for being different. Michael Jaecks: Some good details all around, I like the eyes, mouth, and legs... but not so crazy about the bone neck or triceratops horns. The foreground plants are so dark and busy they come off distracting to me, but I really enjoyed your background man! 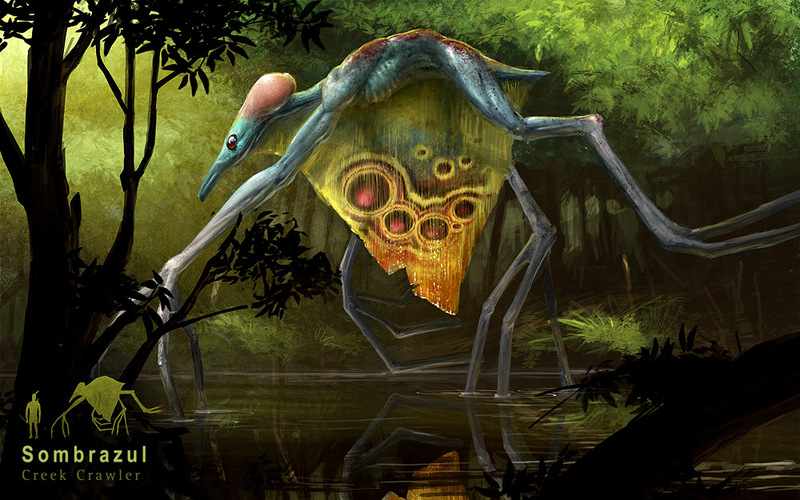 Supervlieg: My favorite creature design by far, and you usually always have amazing and creature designs. The sketch you made was incredible, the angle and transparent body. The background is outstanding, just beautiful and serene. I'm not crazy about the color choices you made on the creature itself, or the stiff feel to the hanging skin BUT it's such a wonderful piece I hate to say anything bad. Always a pleasure to see your art. KaWaii: I was thinking you might be able to play around more with a variety of color to do your highlights and shadows rather than black and white. I am constantly trying to tell myself to keep the light source in mind before any detailing as well, not sure if that helps. I like some of the features on this guy, the long ears and swirling shell especially. Cloister: I really like the whole rear half of this creature's body, great! the front started to feel just a little cut+paste from animals and less cohesive (if that makes sense) I dig the blair witch vibe you have going on! aspenboy: I love the background! If the whole piece had this vibe I think it would have really been a favorite of mine. I like the whole concept as an idea, but maybe consider your lighting a bit more before detailing things. This is still my biggest struggle, to ignore details and work on lighting and composition first. 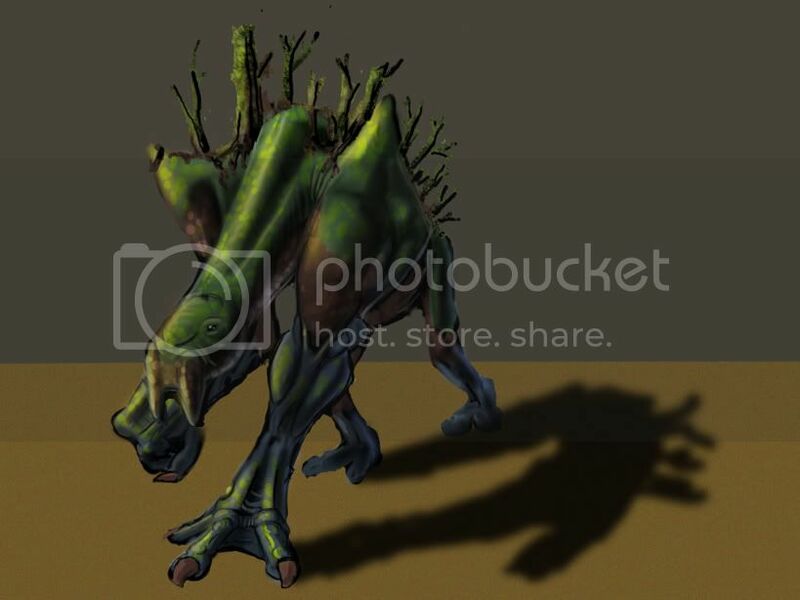 For instance the middle tree behind the creature has the same highlights as the tree behind it on the left, and that flattens the picture a bit. Also the creature in the water has some highlights fading pretty far away from the light source which are drawing my eyes to it when the rabbit and creature are the focus. Keep it up, i like how different it is! fughi from yuggoth: Description is pretty sweet, it seems like you rushed the piece a bit though. Ostrander: Your details are great man! The lighting is throwing me off a little (for instance the sun appears to be setting in the background, but we have a sharp highlight on the creature.. or the leaves on the tree are a little flat and don't show the round depth trees have. Great concept, and I really like the water and scene layout! ArtZealot: This guy feels straight out of greek mythology for some reason, maybe its the cyclops The rocks to the left of the beast keep fighting for my eye's attention, and you could try playing with more color in the flesh and greenery. It sort of feels like only 2 colors were used for the entire scene. I like the whole cow approach because they definitely frequent streams as well, creative touch. Lodin: The monotone color and vertical seaweed don't show off the depth too much to me. However, I think it's a great piece with a cool creature design and scene layout. Is that a creek or an ocean? crazyace31: I feel like the black shadows and simple background distract too much. I like the golum effect going on with the sticks on his back. ScaryPotato: Pretty clean details, and nice pokemon feel to it hehe It looks like an aquarium rather than a creek but not a big deal. AztcFireFlower: This guy is kinda crazy hehe. The face features don't seem functional as anatomy for some reason, but I'm digging the seal body with a shell. Moai: Fantastic sketches! I really enjoyed these and was quite amazed. The finished piece does feel a bit "stepped on" like someone mentioned. Maybe try adding in some more color variations, and a lighting scheme that focuses on the creature. rawwad: Everything about this entry is great to me, except the "golf holes" in his back hehe. It appears you were going for a slight comical vibe though so no worries. I really liked this one, especially the lower "spotlighted" scene. banhatin: Freakin awesome sketch, and details overall! I feel like the light on the mountains to the left distracts more than compliments the piece, and the lighting feels off a little with the sun setting in the back but white highlights on the creature where he'd be in shadow. The rock that he's sitting looses some depth and texture from that soft highlight going across the whole rim. Really awesome creature design, details and pose though! Last edited by Stephan_R; September 8th, 2006 at 10:21 AM. Stephan_R Seal body w a shell......LOL, glad you dig it. Okay, will be more complete with the conceptualizing B4 going on to the finish. Thank you. I appreciate the crits and am motivated to try harder for next COW entry. Jakkas, Supervlieg, Stephan_R, Banhatin, rawwad - real nice entries guys. Michael Jaecks - this is a big improvement over your last one. keep going! Ostrander - try playing around with some gradients and some overlays, softlights, multiplies and all that good stuff to give it a more cohesive feel. - Make a new layer over your painting and pick a warm (orangish) and a cool (blueish) color and do a gradient, then set the layer to softlight, overlay, etc, and play around with the opacity till its just right. It works wonders. Sorry I dont have time to give everyone crits, gotta get some sleep. For me it was a tough choice between Jakkas and Stephan, both great ideas with extraordinary execution. Ended up voting for Stephan. And about the perspective, I knew something was wrong, since Supervlieg also said the same thing back then during my WIP. I fixed a little, but it still doesn't look right. I think you have fixed the problem, thx ! Yes, thx for the C&C's this week . Will be working on the tips again ! Indeed. Like the others said, I should work with more colors and variations about lightning stuff. Hope to be able to fix that the coming weeks. C.O.W. #215. Hissing, Shelled Canopy-Crawler - VOTING!